Getting there: Head south on Hwy 183, past Hwy 290, the Colorado River and Hwy 71. After passing Hwy 71 Austin Bergstrom Airport should be on your left. Be on the lookout for McKinney Falls Parkway on the right. There is a brown state park sign that also marks the turn. McKinney Falls is about 3 miles from that turn on the right. The Hikes: McKinney Falls State Park is located on land previously owned by Thomas McKinney, who moved to the area in the early 1850's. McKinney was, among other things, a breeder of race horses. He also built one of the first flour mills in the area. 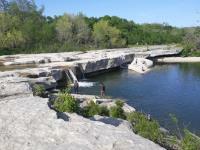 McKinney Falls provides fairly good variety in terms of hiking terrain. The Onion Creek hike is moderately long, but easy to tackle. The paved trail means that it can be enjoyed by wheelchair explorers. The upper Onion Creek hike is a fairly easy path to follow, but is not paved and seemingly not supported by the park. Although part of that trail leaves the park boundaries it is well worn but not highly traveled. The falls at McKinney Falls are among the most impressive that you'll see in the Austin area. Upper McKinney Falls is molded much like Sculpture Falls on Barton Creek, but on a larger scale. The water is cleaner than in years past, though the water quality is questionable enough such that you might want to think twice about swimming in Onion Creek, which is a pity. The Rock Shelter trailhead begins a short distance from the Smith Visitor Center. Rock Shelter: McKinney Falls State Park is named after 1850's settler Thomas McKinney. However, use of the land that makes up the state park predate McKinney by several hundred years. 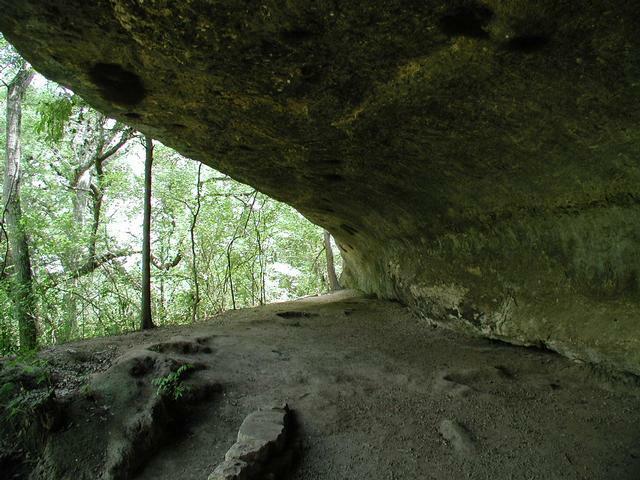 The rock shelter that overlooks Onion Creek was a natural site for local Indians to use to escape the elements. 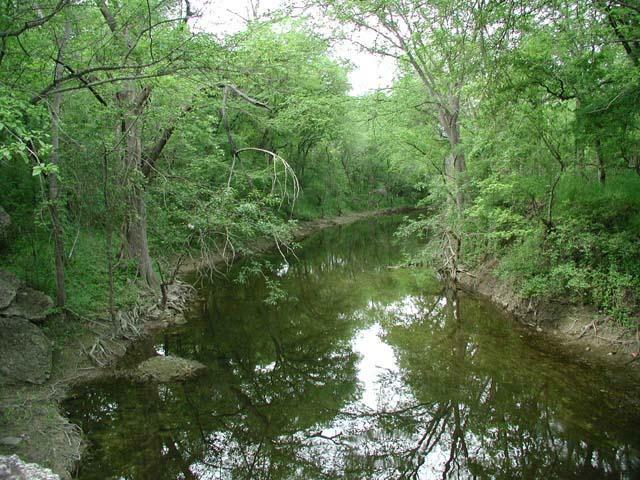 Tonkawa Indians used the site up to the 1800's. 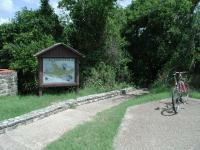 The Rock Shelter trailhead is just to the northeast of the Smith Visitor Center near Upper McKinney Falls. The path is immediately sheltered from the Sun by the thick tree cover. 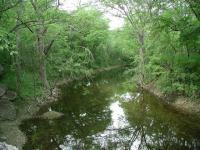 Most of the trail will follow the course of Onion Creek closely, which means there will be plenty of trees. As you walk on the bridge that crosses a small feeder stream look look for the huge Bald Cypress at the waypoint "Cypress". The park estimates that this gigantic 60-foot tall tree is 500 years old. The height of the tree is not so impressive as its massive girth, easily the largest you'll find on the trail. The Rock shelter overhang provides refreshing relief from the summer Sun. This is a short trail of approximately half a mile in total, so the shelter is not too far from the trailhead. Note that this formation is not a cave. 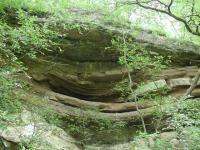 Rather, it is a rock ledge that overhangs the rock below by about 10-15 feet. This is more than enough room to seek shelter from the rain. During the hot day on which we hiked this trail it also provided pleasant relief from the heat of the day. The shelter was formed by the flooding waters of Onion Creek, which eroded the softer rock below the layer that now overhangs the shelter. Soon after leaving the rock shelter the trail turns to the east and then to the south. The second half of the trail is only a stone's throw away from the first half, but it feels like a whole world away. Gone are the Bald Cypress trees and gone is the continuous tree cover. Pocket prairies dot the trail exposing hikers to a bit more Sun, but also more wildflowers. During the right time of year one is likely to see Dayflower, Lantana and Turk's Cap. Where the possibility exists, generally take the right fork in the trail to stay on the official path and keep under tree cover as much as possible. At the quarter mile mark on the trail there is a group of picnic tables and a restroom available. The trail ends at the parking area of the Smith Visitor Center. 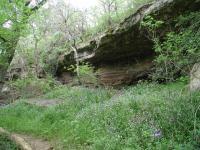 The Onion Creek Trail can be enjoyed by hikers of all abilities. 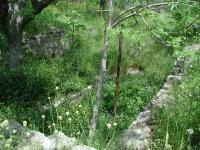 Onion Creek: The Onion Creek Trail loop is a relatively easy hike that is entirely paved. Not even the Town Lake Hike and Bike Trail has as consistent a surface as you'll find here. That makes this hike about as easy as you can get and still be called a hike. Despite the paved trail and camping spaces dotting the park you'll still be afforded some great views and peaceful settings. 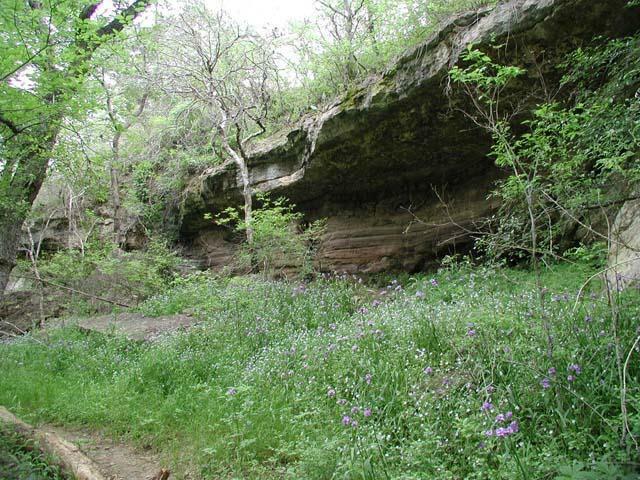 McKinney Falls plays host to lots of wildflowers in the spring. Onion Creek Trail contains the most wildflowers that you'll see in the park. 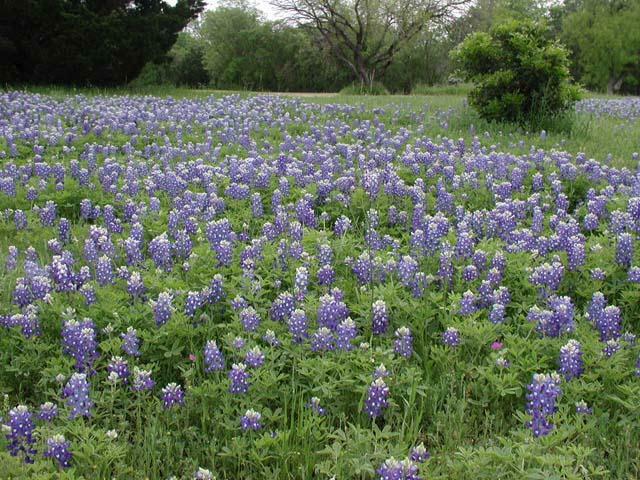 Due to the nature of the trail, with trees and shrubs close in to the trail you won't see any wide open fields of bluebonnets, but you will see a consistent sprinkling of flowers along the side of the trail. Thankfully, they are largely untrampled. Remember, if people walk on the flowers they may not recover in time to germinate for next year. Stay on the trail and take photos. Don't trample any vegetation! As the trail nears the park's front entrance you'll come across the remains of one of the rock walls that were used to contain McKinney's horses. McKinney was an avid horse breeder and his property included numerous breeding and exercise pastures as well as a training track on the other side of Onion Creek. Only parts of the Horse Trainer Cabin's walls remain. 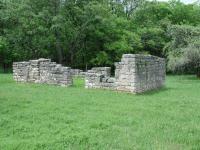 McKinney's horse trainer, John Van Hagen, had his own cabin, the ruins of which you can see from the trail. 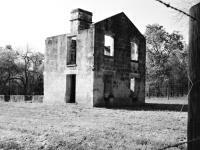 The structure was built in the 1850's and used through at least the 1870's. The ruins are surrounded by barbed wire fencing to keep it from being damaged by visitors, but it's still possible to get a good look at the remains. Upper McKinney Falls adjacent to the trail is one of the nicer looking falls you will see in Austin. The rock has been carved in an interesting pattern reminiscent of Sculpture Falls on Barton Creek. However the extent of the water carvings and the water flow are greater here. Judging from the amount of rock that was carved but serving to control the water flow on the day of our hike the falls must be even more impressive after a great deal of rain. 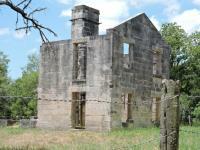 Homestead Trail: The Homestead Trail is the wildest officially supported trail in McKinney Falls State Park. The northernmost parking area marks the trailhead for Homestead. Much of the initial path lays on a huge rock outcropping. Years of people coming and going has worn a visible line down the rock headed towards Onion Creek. The Homestead Trail lies on the other side of Onion Creek from the parking area. So you have the option of wadding across the creek or, if the water level is low enough, hopping across the rock high points near the edge of the falls. 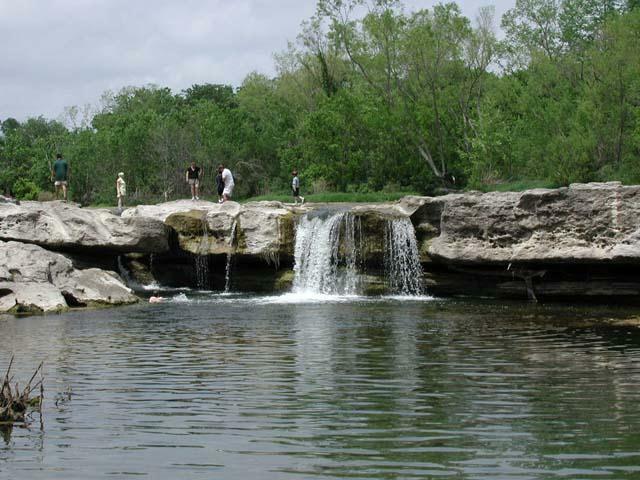 The most opportune rock hopping routes lie near the edge of Lower McKinney Falls, so a slip and fall could lead to disastrous consequences. Proceed carefully and just wade upstream if there's any doubt about successfully making the leaps. 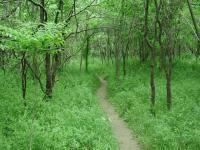 Most of the Homestead Trail is narrow and engulfed in trees and grasses. The waypoint "McKinney Homestead" marks the location of the remains of Thomas McKinney's home. The house was constructed in the 1840's from local materials. It remained in use up until the mid 1940's when it burned. 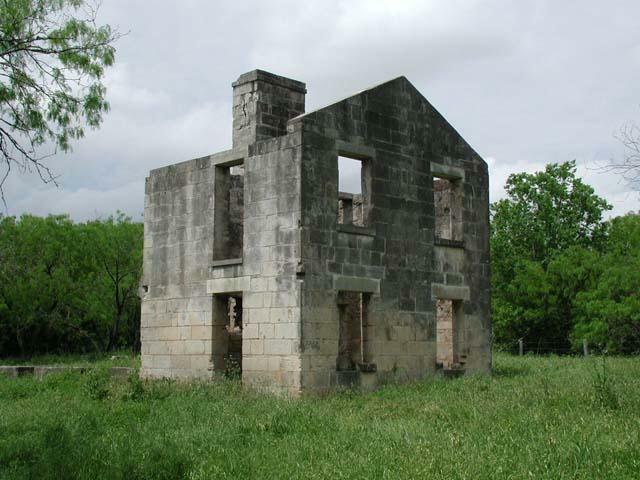 When McKinney Falls was first turned into a park in the 1970's some effort was spent stabilizing the remains of the Homestead to prevent collapse. The trail surface is a mixture of jeep trail and single track that meanders back and forth in the upper third of the park. The scenery in this portion of the park is rather plain. The terrain is flat and the abundant tree cover prevents most wildflowers from blooming and blocks any change of a long distance view. The flat terrain does make the going easy however. Little remains of McKinney's Flour Mill, washed away in a flood. Note that this trail in no way matches the route shown on the official guide map that is handed out at the park headquarters. This is not a separate trail from that mapped. The trail is just quite a bit different than they report. Completing the loop makes the actual shape of the trail a moot point. 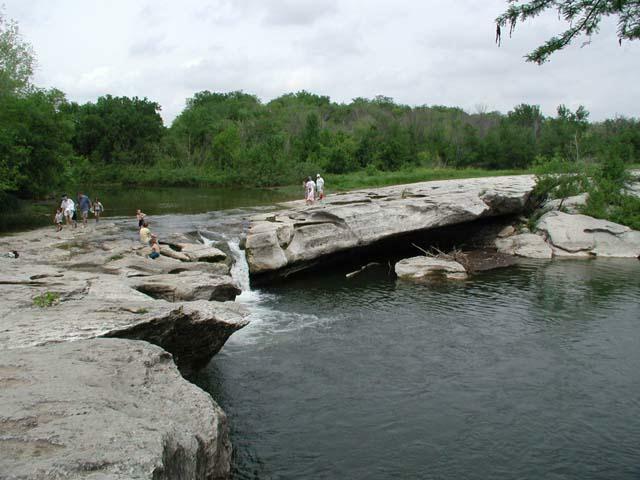 The northern end of McKinney Falls State Park also serves as the headquarters of the Texas Parks and Wildlife Department. The fields next to the fitness center contain some of the largest groupings of wildflowers that we've seen in the park. 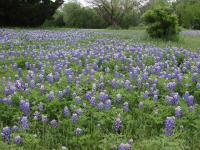 Lots of bluebonnets, indian paintbrushes and many other varieties. Near the end of the hike is McKinney's Grist Mill. It was built in the 1850's and used to ground flour. Little remains of the edifice today as most of it was washed away in the flood of 1869. 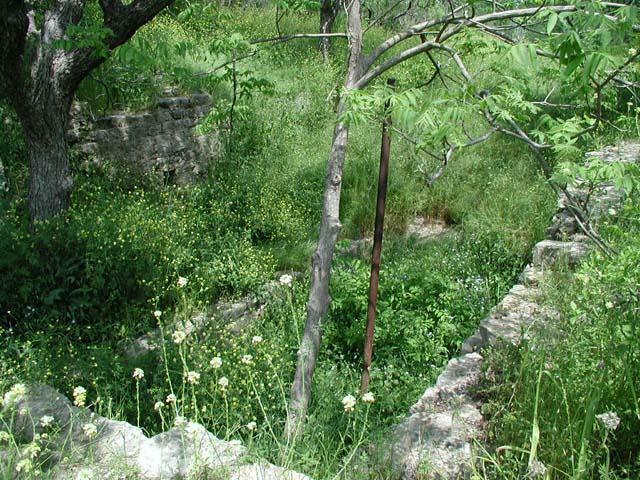 The stone basement of the mill and the iron rod that held the water wheel in place are there, along with a plaque showing a drawing of what it looked like in the past. Rock face along Upper Onion Creek. 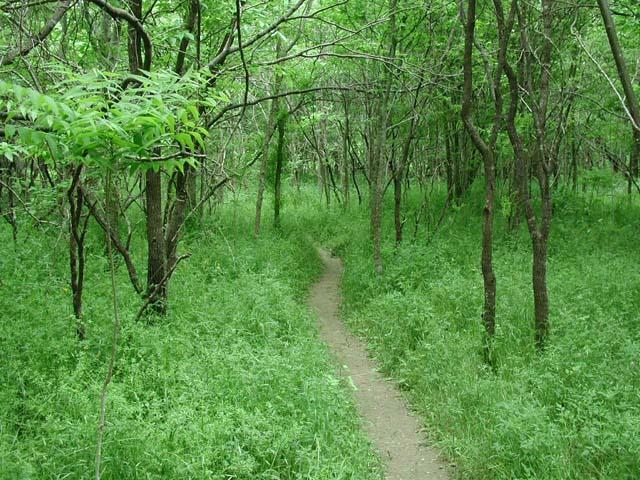 Upper Onion Creek: This is an unofficial trail that meanders off from McKinney's main Onion Creek trail loop. It's possible that the a portion of the trail might cross the park's southern boundary, so be mindful of any signs along the route barring entry or a continuation of a hike. We saw none on our trip. The rock face has an interesting wavy pattern. Since the trail is unofficial and less utilized, you'll be rewarded with a bit of a wilder experience than that found on other trails in the park. During our visit we didn't see a single person on the trail. What you will see are some small scale natural wonders. A nice set of rapids can be found along the path. You'll also come across a large rock outcropping adjacent to the trail resembling a mini Enchanted Rock. Not too far down the path from the rock outcropping is a large of rock face overlooking the creek. What makes this overhang particularly interesting is the wavy pattern of the rock layers. The trail kind of peters out at the point that we turned around, though it's conceivable that one could go further. Actually, there are plans afoot to combine the trails of many parks in the south east Austin area, creating an impressive trail system. 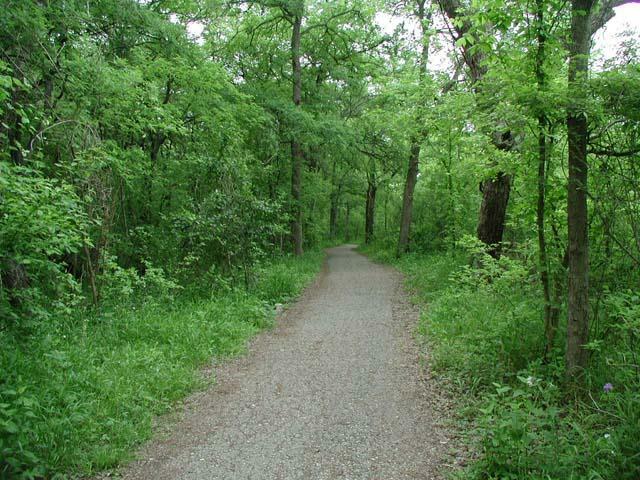 It's possible that this corridor might be used to connect McKinney Falls State Park with Austin's Springfield Park to the south. Near the southern terminus of our hike we were rewarded with the sight of a field of abundant wildflowers with large numbers of butterflies moving about rapidly from flower to flower gathering nectar. Trails reopened to both of upper and lower falls. Still couldn't cross over to the homestead. Some trails here are still closed from the flood, but we still had a good time! This place was packed today due to the unseasonably warm weather. We had planned to hike the Onion Creek Trail on the south side of the park, but it seemed to still be closed from the Fall floods, so we made our way through the water and hiked around the Homestead Trail Area. The ruins of the old gristmill and home are pretty neat, but other than that the trail is pretty unremarkable. It was still nice to get out in this great weather, though. If I hadn't been running on a tight schedule we would have made our way to the Flint Rock Loop on the north side of the park to make for a longer hike, but that will have to wait for another day. As always, the area around the lower falls was enjoyable due to the neat rock. This area has always reminds me of the surface of the moon. we couldnt do the homestead trail cause of high water..
McKinney Falls State Park is a very scenic and popular park. 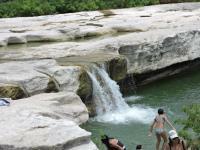 There are some beautiful water falls along Onion Creek and natural pools where you can cool off and go swimming. 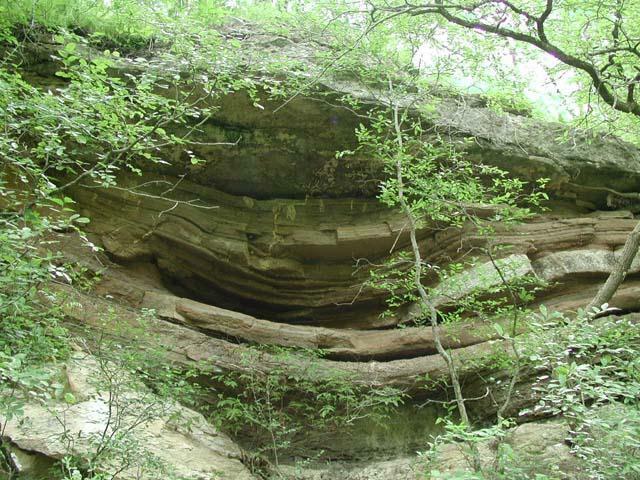 There is also an interesting rock shelter formation above the creek. 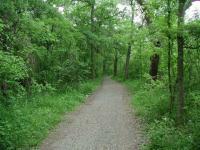 There are a number of trails in this park which provide variety in scenery and mileage. The trails are well-marked and easy to follow, except for the area where you cross over the creek. This spot is solid limestone and there are no signs showing where to cross, but if you study the map they provide you at the park entrance then you'll figure it out. Hiked Onion Creek Hike and Bike Trail.